Here you all are, at one of the city’s finest new beer gardens, and nobody suspects a thing. There’s foosball. There’s olive trees. There’s a whole lot of beer. Beware. The vegans are among you. And they grow stronger. 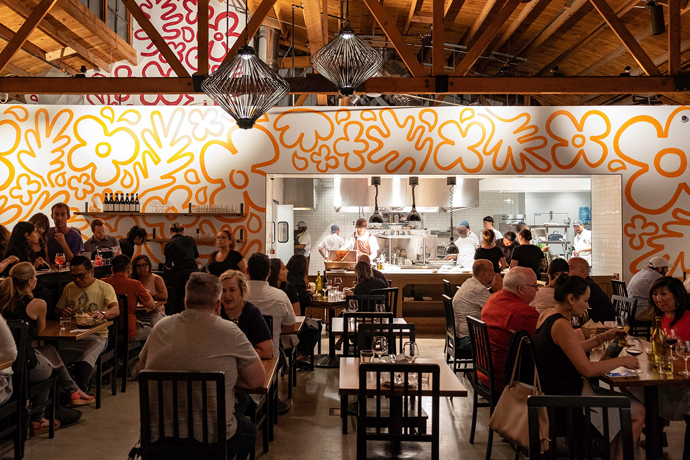 Welcome to Sage, a big, beautifully rustic restaurant and massive beer garden that completely forgot the meat and dairy, now open in Culver City. Under an archway surrounded by boxed herbs, you’ll see it: the majestic beer garden full of communal oak tables, wagon-wheel chandeliers and rusty farm equipment. They say it’s the biggest beer garden in Culver City. You say... something about jackfruit nachos, please, and that vegan/organic beer still sounds like beer. (They’ve got 24 on tap.) And so it is that afternoon becomes evening... becomes night. Alternate scenario: you’re on a dinner date. With the kind of person who does inversions and doesn’t eat steak. That’s when you’ll head inside. The walls are made of mixed farmhouse woods and pallets, and the bar stools are topped with tractor seats. It all sets the stage for kombucha and wine on tap, tempura-avocado tacos, delicious mole bowls and fake banana splits. Well, the banana part is real.